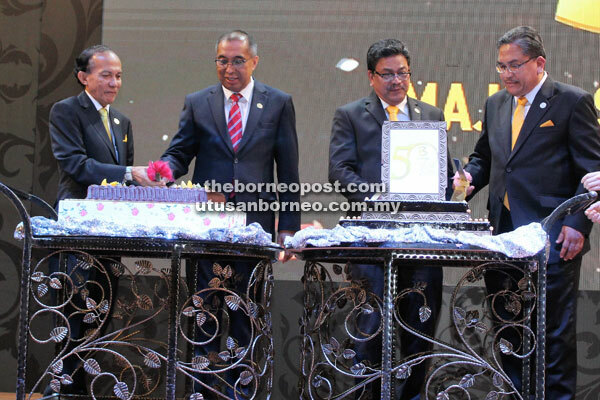 (From left) Bernama chairman Datuk Seri Azman Ujang, Salleh, Bernama general manager Datuk Zulkefli Salleh and Bernama editor-in-chief Datuk Zakaria Abdul Wahab cut the golden jubilee cakes. Bernama general manager Datuk Zulkefli Salleh (left) presents the special award to See Hua Marketing manager Pattrik Ting. KUALA LUMPUR: The Borneo Post and See Hua Daily News have received an award in conjunction with the Malaysian National News Agency’s (Bernama) Golden Jubilee. The Special Award for Loyal Bernama Customers (Media) was presented to the two See Hua Group newspapers here on Monday. Awards also went to New Sarawak Tribune, Asia Times, Sabah Publishing, Sin Chew, Kwong Wah Yit Poh, Eden Value, The New Straits Times, Berita Harian, Utusan Melayu, Nanyang Siang Pau, China Press, The Star, RTM, Malay Mail, and Media Corp Singapore. A press statement yesterday said Bernama also presented awards to 18 non-media recipients. Deputy Prime Minister Datuk Seri Ahmad Zahid Hamidi commended Bernama for its success in facing various challenges since its establishment 50 years ago. “As we know, the presence of new media such as blogs, news portals, online newspapers, Facebook, WhatsApp and others provide a new platform that have the support of all parties, especially the young,” he said in a speech read by Minister of Communications and Multimedia Datuk Seri Salleh Said Keruak. “The advent of the Internet and technology allows everyone to be a writer, analyst and disseminator of information. Zahid said this is why Bernama stands out. “The principles and approaches in the field of journalism are proven to very effective in delivering authentic information to their customers. This allows people to get the right credible information to be used as a reference source,” he said.